(Edmonton) After graduating from high school, the last thing on Joshua Peters’ mind was a university education. Today he’s in his second year of the civil engineering co-op program and had 13 job interviews for the upcoming co-op program placements. “I wasn’t mature enough to go back to school right off the bat,” confesses Peters. But after seven years of working various jobs—as a carpenter, a framer, taking a year off to play hockey in B.C. and then working as an apprentice powerline technician—he realised he had the right stuff to become an engineer. You could say that he is a mature student—in more than one sense of the term. It was Josh’s hockey team coach Terry who taught him perseverance in achieving goals – in sports and life. It was also Terry who saw him getting a university degree further down the road. They met when Josh Peters credits the coach of a junior ‘B’ league hockey team, the Beaver Valley Nitehawks, in Fruitvale, B.C. for helping him believe in himself. With the coach’s mentoring, Peters learned to work hard toward success and soon became a leader on the team, which went all the way to a championship win. The next destination was home, Medicine Hat, AB, where Peters then worked for two years as a powerline technician with Valard Construction. “Through powerline, you see all the things where you can help out,” he said. Long hours in the cold and tiring shifts never stopped him from wanting to see beyond cables, wires, and transformers he was working with. After two sessions in trade school, he developed an insatiable thirst for knowledge. “I wanted to learn and see a bigger picture. All of a sudden, I had questions for so many people,” he says. The interest in how the equipment he worked with on a daily basis was designed brought him to the company engineers. This is when Josh realized he was ready for a new career leap. “Deep down, I had more in me,” he said. He completed high school upgrading and qualified to study his first year of engineering through a transfer program at Medicine Hat College. 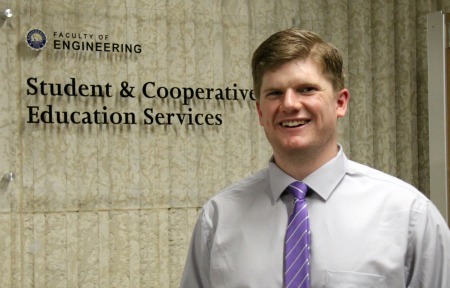 In September 2015, Peters joined co-op program in the Department of Civil and Environmental Engineering. With various hands-on experiences under his belt, he attended 13 job interviews. It’s no secret that the downturn in the province’s economy has cut job activity. Some co-op students are struggling to even find a job to apply to. But Peters says it appears the demand for civil engineers remains high. “Even in the slow economy, there is a lot of money going into infrastructure, roads, and bridges,” he said. The Faculty of Engineering has one of the largest engineering co-op programs in Canada, with employers providing students with paid engineering positions. Through the program, Peters is hoping to make money to help finance his degree, and get his foot in the door with potential employers. What’s more, he’ll get valuable hands-on engineering experience, connect with the people in the industry, and improve his interview and job-finding skills. “The co-op program opens the door to so many experiences. There are so many opportunities and companies out there,” he said.